Flashlights are vital household items for infinite reasons, but it is important to note that they can have a lot of different functions, as well. 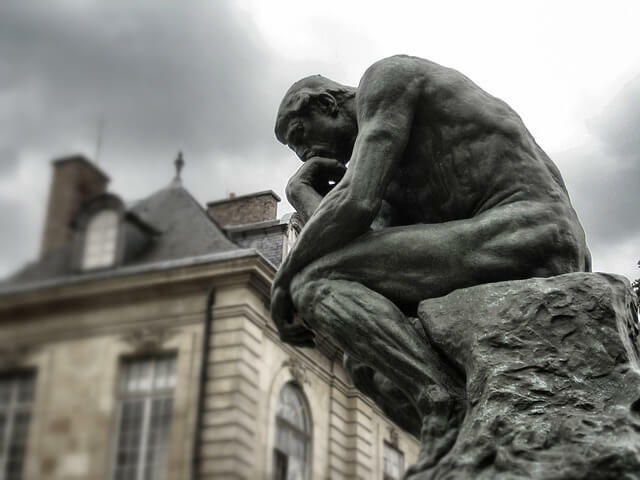 It is imperative to think beyond needing a tool that will simply turn on a light and begin examining all of the different uses of a tactical flashlight and why you would be using it. Tactical flashlights are often used for a number of outdoor activities that go far beyond a casual stroll in the dusk. A good, solid tactical flashlight can be your companion through tough bicycle riding, camping, marksmanship, or a causal stroll in the woods. Investing in a good light means that you will rely on it heavily through a lot of events, so make sure you are purchasing the best tactical flashlight for your needs. Each flashlight review below lists out all of the key selling points for each torch. Be sure to explore your options while scrolling through the tactical flashlight reviews and keep in mind the main reasons you will need a dependable tactical flashlight in your life. You’ll notice all of the top picks have LED bulbs – and this is for a reason! LEDs are extremely energy efficient light technologies because they last longer, are tougher, and just all around have better quality than different bulbs. Unlike incandescent or fluorescent bulbs, LED lighting emits light in a very specific direction. LED lights do not radiate heat the way an incandescent or halogen bulb will. They are safer this way because heat is drawn away from them, so they are great for flashlight usage. Whether or not you choose one of the tactical flashlights below, it is still strongly recommended you consider an LED flashlight. Like most things, the size and weight of tactical flashlights can vary. Some of these flashlights come in larger sizes while others will fit in your pant pockets. Keep in mind that the varying sizes all depend on what activities you will be using your lamp for, and which functions are most important to you. Even small, handheld lights can be mounted on bicycles or used for stationary light, so consider the size for travel and storage when shopping for a great tactical flashlight. Tactical flashlights are also commonly mounted on weapons for more exact targeting. Some of the most top-rated tactical flashlights offer high-quality bulbs and other additional features. The tactical flashlight reviews below will be helpful in explaining all of the features you will find and need when searching for the perfect lamp. 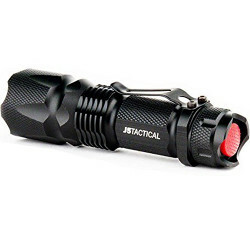 The J5 Tactical V1-Pro Flashlight is one of the best tactical flashlights on the market. This light has a really bright LED bulb (300 lumens) and can light up to 600 feet. Not only that, but also that bulb has different modes including high, low, and a strobe mode. The convenience of this flashlight is hard to beat. It runs off one standard AA batteries that will last you for more than one hour of continuous use, plus it makes them easy to replace. The body of this tactical flashlight is heavy duty but it is also compact since it is a handheld light. In terms of cost, size and brightness, this may be the best tactical flashlight. The Vizeri Cree T6 is a great outdoor flashlight. It claims to produce a blinding light comparable to the other top tactical flashlights. Coupled with the beam, it comes with 5 different modes, high, medium, low, strobe and SOS. These makes it highly versatile for different situations. The body is made of military grade aluminum and have a hardened anodized finish. The product also boost water-resistibility, able to be submerged to a depth of 3 feet. This flashlight can be powered by cheap AAA batteries. Making it a low maintenance, high power monster. Without a doubt, this deserve a top place in our review. The Outlite A100 is an extremely functional lamp, and maybe one of the most practical. This flashlight is powered by either one 3.7V 18650 battery or three AAA batteries, making it easy to switch out. This flashlight also has five switch modes: low, medium, high, strobe, and an SOS function, as well. The lamp has a high-efficiency LED chip that is nice and bright with 900 lumens. 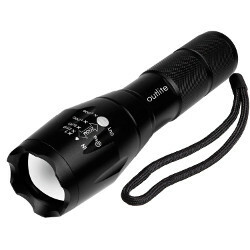 This Outlite A100 is also water resistant, but on of the most unique features of this light is that it can easily be stood up securely on a flat surface to also serve as a candle. The PeakPlus CREE XML is one of the brightest outdoor lights you can find. The LED chip delivers a max brightness of 1000 lumens. This light also includes a zoom function and adjustable focus range with five light modes: low brightness, medium brightness, full brightness, strobe, and SOS mode. In addition to all of that, this light is also water resistant, anti-abrasive, and skid-proof. This is truly one of the best outdoor lights. 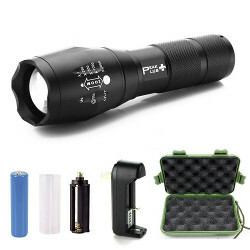 When you buy a PeakPlus CREE XML, you are buying the full flashlight that includes a high-quality rechargeable lithium ion battery, a lithium batter charger, a sturdy case, and of course, the fantastic flashlight. 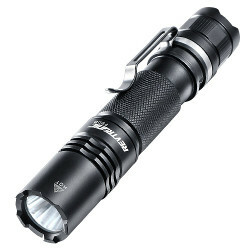 The Supernova Guardian 1300 is great for someone who is looking for a flashlight that can do it all. Essentially, this light is perfect for extreme and less extreme outdoor activities because it can survive all of it. The ultra bright CREE XM-L U2 LED bulb has a huge area of focus that also includes five operating modes, including a strobe mode. Plus, this light has a remote pressure switch. This tactical flashlight has rechargeable Lithium 18650 batteries and also includes a charger when you purchase it. The casing on this flashlight is waterproof, meaning it will be safe in all weather usage. 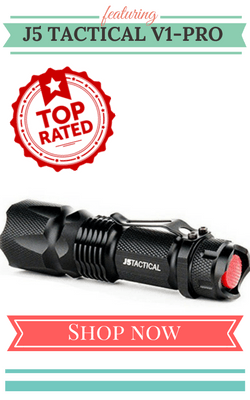 There are quite a few amazing tactical flashlight brands listed in this article, but it is hard to include every reliable and trusted tactical flashlight brand. It is also important to recognize some of these other wonderful brands that product extremely high-quality and reliable flashlights. Below are three brands that manufacture dependable tactical flashlights that are also worth visiting during your hunt for the best tactical flashlight. Since 1979, Maglite has been a leader in producing quality flashlights and have been recognized over the years for their high-quality tactical lights. All of their products are produced in the United States and they are focused on preserving American manufacturing jobs, truly upholding their tagline “Building an American Icon.” In addition to building the best tactical flashlights on the market, Maglite also gives back to communities, organizations, and individuals across the country. Fenix was established in 2004 and is a leading brand in outdoor sport equipment. Fenix manufactures sport lighting tools, bike lights, camp lanterns, and an array of other accessories. They are now members of major international industry associations and are continually recognized for their quality products. Fenix stays true to their mission and the interpretation of their brand name: to build the “perfect thing.” Fenix’s products are extremely reliable and some of the best tactical flashlights around. Although Brightex has only been around for a few years, do not let that discourage you from their amazing products. As a company, they are focused on high-quality tactical flashlights that are also as affordable as possible. Brightex is one of the best brands to consider if you want a flashlight that won’t break the bank, but is also incredibly dependable. We concede. Quality tactical flashlights are hard to come by. You might think that we can only find 5? Here’s 5 more! 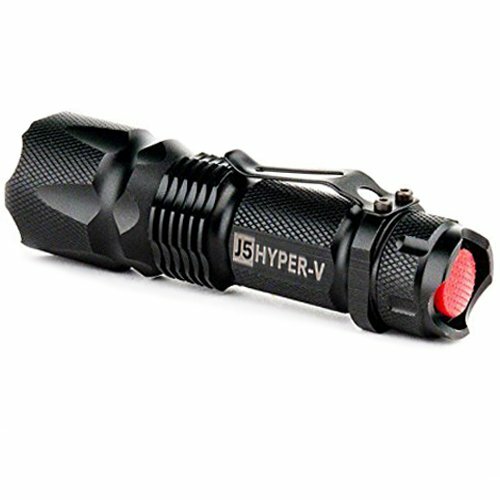 The J5 Hyper V Tactical Flashlight is one of the best tactical flashlights that can be found. This light has a really bright LED bulb (400 lumens) and can light up to 800 feet. Not only that, but also that bulb has 3 different modes including high, low, and a strobe mode. The convenience of this flashlight is impeccable. It runs off three standard AAA batteries that will last you for hours, plus it makes them easy to replace. The body of this tactical flashlight is heavy duty but it is also compact since it is a handheld light. The AYL TC80 has a telescoping body making it super compact and even better, it is lightweight. This flashlight has a 180-degree extendable and retractable body and though it does not weigh much, it has a powerful magnetic base that allows you to attach it to any magnetic surface. 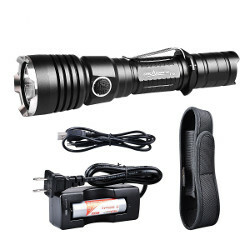 This tactical flashlight also has outdoor durability, meaning it is shock resistant, water resitant, and is made to last all weather use including torrential rains and floods. 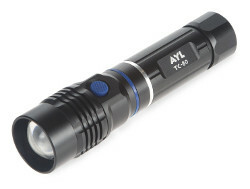 The light on the AYL TC80 is a bright LED that spans over 300 feet from the front light. It includes a 3W COB LED and 15 red blinking LED lights across its body. The ORCATORCH T30 has reverse polarity protection design that is made to shield against improper battery installation. This flashlight can also be charged by any and all devices with a USB port, meaning you can use your phone adapters, computers, a power bank, and other similar sources. This flashlight also has several lighting modes. The low light is perfect for walking, while the medium and high settings are great for when you need stationary light. The ORCATORCH T30 also has a strobe mode that can be used for safety and defense. It also includes a dual switch design for quick access to a momentary-on function and the strobe mode. The fact that the Revtronic Compact Tactical Flashlight is both small and lightweight is a definite selling point. This tactical flashlight is great for outdoor use, law enforcement, security, emergency medical service, hardware and tool usage, as well as personal use. The body is anti-roll, slip resistant, and also includes a pocket clip. This tactical flashlight is durable and made of aircraft-grade aluminium, which makes it impact resistant and corrosion-proof. In addition to all of that, this flashlight has a three-hour run time on high mode and a powerful LED with a lifespan of 50,000 hours with a max output of 650 lumens. In addition to being only 5.1 inches in length, it is easy to handle with one hand, making it very convenient. 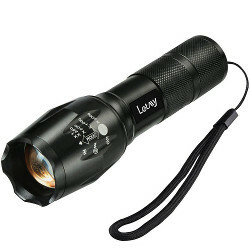 The Letmy flashlight is functional torch, boosting 5 different lighting modes. High, Medium, Low, Strobe and SOS. What makes this different from the rest is the cost of having one. 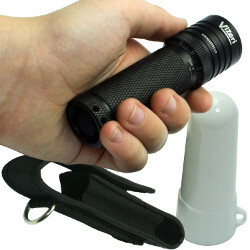 The low cost coupled with the functions makes it a viable flashlight to have. Not forgetting to mention, it has a dangerously bright beam. At 1600 lumens, it definitely can turn night into day with a switch. Do not write off a tactical flashlight as a tool that will just simply put on a light, because a good tactical flashlight can provide so much more than that. Not all tactical flashlights are built the same; they come in different shapes and sizes and offer a variety of different features. Even though you can certainly expect your tactical flashlight to illuminate your pathway, do not discount what else your tactical flashlight can offer. If you know that you will most likely end up throwing your flashlight in your pocket, then size is certainly something to consider. Some flashlights can retract to smaller sizes and some are initially built to be smaller, so make sure you know what size you would want. This way, you know you will not purchase a large light if you plan on carrying it around in your pocket often. Think past the simple function of a flashlight and ask yourself what other features would be beneficial to you. A lot of tactical flashlights include clips for pockets and belts, others are highly magnetic, and some can be mounted on a bicycle or a weapon. You will undoubtedly be grateful for the fact that you can easily mount your light on your bike, or if you can conveniently clip it on your belt, so definitely think through those features. Though each flashlight will certainly light up and illuminate whatever is in front of you, you still should think about exactly what kind of light you will need. If you will need to be very conscious about safety while using your flashlight, then it is probably best to invest in a light that has a strobe mode. If you will use the flashlight for an assortment of activities, then it will be helpful to have a light that ranges from low light to a more intense one. The build and body of the flashlight is also important. If you know that you will often be using this flashlight outdoors, then it is definitely good to consider how resistant the flashlight is to sliding, scratching, rain, and other harsh weather. 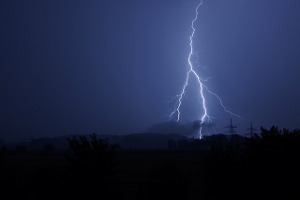 You would not want to invest in a flashlight only to find out that it will be destroyed when exposed to light rain – especially if you plan on being outdoors often. Most of you may know these, if not more, already. But, there is no harm in checking it out right? These tactical flashlight reviews should give you an idea of what kind of torch will be perfect for your lifestyle. Remember that size, features, modes, and durability are all important points to consider when shopping around for the best tactical flashlight. Always consider what the main reasons of use for your tactical flashlight will be, and keep those in mind when reading reviews. For instance, if you know that your flashlight will encounter harsh weather often, then definitely invest in a waterproof light. If you are an avid bicyclist, consider one that is either magnetic or comes with a clip or mount. If you find yourself wandering during late night walks or if you are a camper, then it would be wise to buy a flashlight with an extremely bright and long-lasting bulb. Whatever the reason is for purchasing a tactical flashlight, we can almost guarantee that there is one out there that can fit all of your needs. 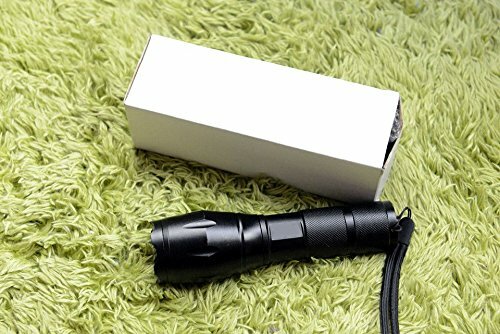 These tactical flashlight reviews will surely be helpful in finding the best possible flashlight for you.